My metal roof was red, hot, and desperately needed painting. After spending some time inspecting the roof, I quickly realized how incredibly hot the red paint became even on a modestly hot spring afternoon. Why repaint the roof red since it gets so hot? I thought there must be a better solution so I started investigating roof paints. Fortunately, I wasn’t the only one wondering if a lighter-color roof would reduce heat gain inside the attic and save energy. Also, I quickly learned a lot about “reflective” paints, radiant heat, and the best ways to insulate the attic to reduce cooling and heating costs. 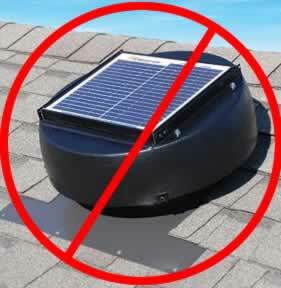 Reflective roofs work because they stop the rooftop heat before it ever gets going. The sun’s rays hit the roof at the speed of light, and at the speed of light they bounce back into space. White or light-colored materials work best, but some new dark pigments reflect enough invisible infrared radiation to reject a lot of solar energy. And whether you’re applying tile, metal, membranes, or even asphalt shingles, choosing a more reflective version seldom adds cost. After reading this article and numerous others, I painted my metal roof with Kool Seal® Premium White Elastomeric Roof Coating which I purchased at the local hardware store (ACE Hardward has it here in Richmond, VA). 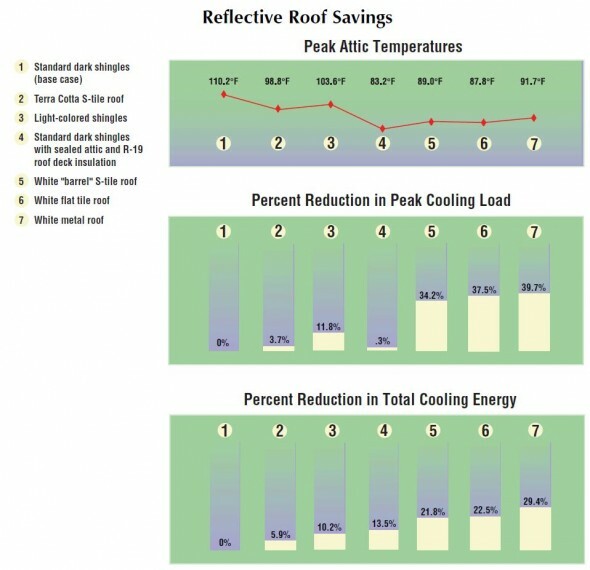 Roof Costs and Energy Savings: According to the Metal Roofing Alliance, white-painted metal roofing has the highest solar reflectance value of any roofing product available and can save you up to 40% of your annual energy bills. According to statistics from McGraw-Hill Construction Research and Analytics®, the number of homes with metal roofs has more than tripled over the past decade, moving metal from 3% of the overall U.S. market to 10%. Some homeowners’ insurance programs allow discounts for homeowners with specific weather-resistant metal roofing products. 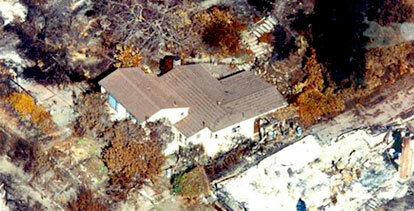 Contact your insurance agent to determine if your home qualifies. Metal Roof Retrofit on a Hurricane Damaged Home by: Dave Chasar, PE. A before/after energy comparison of shingle roof verses white metal roof replacement; includes monitored data collected at the home over several years. Concentrating Photovoltaics – CPV – Ready for Take-Off? CPV systems are poised for significant growth thanks to the confluence of several factors: Renewable Portfolio Standards (RPS) requiring up to 33% renewables by 2020 in key US states, higher efficiency CPV systems, and lower CPV system costs. In the last year alone, over 300 MW of CPV projects have signed contracts with utilities and are now awaiting regulatory approvals and financing. Thanks to these large projects, CPV technology companies may be approaching the critical mass needed to cost-effectively manufacture their systems and compete head-to-head with non-concentrating PV. Can’t make the live event? Register and the presenters will alert you when the on-demand version is available. Register to the webinar to hear about the technologies and new breakthroughs that promise continued improvement, including multijunction cell design and high-volume manufacturing techniques. At the end of the event, audience members will be able to ask questions of the panelists and moderator live! Will Federal incentive programs help change the agriculture industry by encouraging more farms to install solar energy systems? Reports suggest they will for some firms in Virginia. A federal incentive program could forever change the face of Virginia’s agriculture industry by encouraging more farms to install solar energy systems. That’s the hope of Blue Crump, owner of Fan-based Cityspace Construction and Cityspace Solar. Crump recently started pitching solar installations to local farms using government grants and credits as a tasty carrot. Cityspace’s first agricultural project is the new wine-tasting room at Cooper Vineyards in Louisa County. Fifty-five percent of the cost for the facility’s 5.8 kilowatt solar array will be covered by federal incentives. That’s because the federal stimulus bill extended a renewable energy incentive program to businesses and provides a 30 percent grant or tax credit toward the cost of wind, solar or other systems. In addition, a grant offered by the USDA through the Rural Energy for America Program offers agriculture-based business a 25 percent credit. The U.S. Dept. 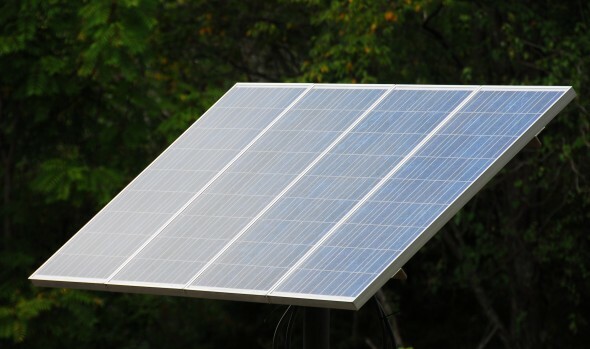 of Energy is another resource for funds and the Virginia Department of Mines Minerals and Energy is seeking $15 million plus in stimulus funds for renewable energy grants and rebates for both households and businesses. SYDNEY (Reuters) – Australia plans to build the world’s largest solar power station with an output of 1000 megawatts in a A$1.4 billion (US$1.05 billion) investment, Prime Minister Kevin Rudd said on Sunday [May 17, 2009]. The plant would have three times the generating capacity of the current biggest solar-powered electricity plant, which is in California, Rudd said during a tour of a power station. The White House Task Force on Middle Class Families, led by Vice President Joe Biden, held its inaugural meeting on February 27 in Philadelphia at the University of Pennsylvania. The Task Force has a simple mandate: to find, highlight and implement solutions to the economic challenges facing the American middle class. With President Obama announcing last week more than $20 billion for investment in a cleaner, greener economy – including $500 million for green job training – the Task Force’s first order of business is to evaluate what investing in green jobs will mean for middle class families. After VP Joe Biden presented at the Middle Class Task Force Meeting and discussed the $19 billion of the American Recovery and Reinvestment act that is dedicated to renewable energy. Solpower Jobs, a green web recruiter, believes Biden’s plan lacks foresight (Source: PRWEB and Solpower jobs). “there is no doubt that smart grid technology is an improvement over the current electrical grid but… The current administration has not recognized the self sufficient decentralized energy sector.” Solpower jobs continued to bash the plan and proposed that building self powered homes was a better use of the budgeted funds. Vice President Biden’s proposal would spend $11 billion of the $19 billion to build “The Transmission Superhighway” which the US Energy Department believes could provide the US with 20% wind energy. Additional information is available at the U.S. Department of energy website. The Middle Class Task Force, chaired by Vice President Biden, is working with a wide array of federal agencies that have responsibility for key issues facing the middle class to expedite administrative reforms, propose Executive orders, and develop legislative and policy proposals that can be of special importance to working families. One of the things that makes this task force distinctive is it brings together – in one place – those agencies that have the most impact on the well-being of the middle class in our country. For more information, visit www.AStrongMiddleClass.gov. Is VP Biden’s focus on the transmission superhighway a wise use of the money? Or, is more critical thinking and brain power needed to address our nation’s power dilemma?